The air compressor model 9815 is the smallest devil in the compressor world. It provides many flexible options at a highly affordable price. This little devil can pumps up bicycle tires sport balls and party balloons, and even your car tires. It inflate a basketball in 12 seconds. It comes with two nozzle adapters and a sports needle making it capable of handling a wide range of jobs. A handy little tool to have in your garage or in the trunk of your car. It is also equipped with a pressure gauge for more convenience. 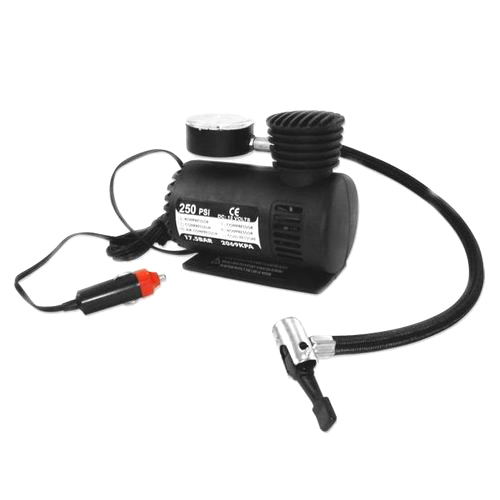 The compressor model 9815 is capable of pumping 15 continuous minutes.